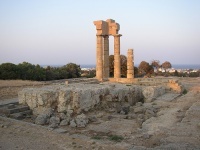 The ancient Acropolis of Rhodes sits high on a hill overlooking the city's west. In the past, it featured sanctuaries, large temples and public buildings, all set on stepped terraces interspersed with gardens. Today's remains date back to the 2nd century BC, though excavations continue at the site. The Stadium, however, has been fully excavated and restored, as has the Temple of Athena Polias on the site's northern edge. Visitors can also see the Nymphaia, a marble Odeon, the Temple of Pythian Apollo and the remains of the Gymnasium. In their day, these sites were used for recreation, worship, lectures and musical events. All in all, the acropolis is hugely atmospheric and worth visiting. Views from the top are tremendous.